This guy is really good: glad to know his name and a bit of his story, since I’m usually too abashed to ask until I’ve been drinking at someone’s bar for at least two years. kevin is a real peach. 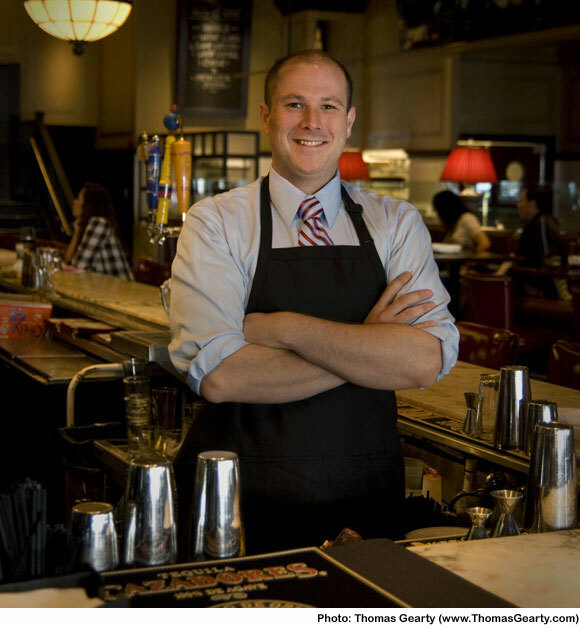 he straddles that fine line between bartender and mixologist as well as anybody in boston. he is also very strong. Two years is not a hard and fast rule, but it’s a good baseline. It’s not that I’m trying to keep things on a strictly business basis, but cheap familiarity is something I want to avoid. In my experience, when many customers introduce themselves to a barman, it’s so they can get a name to call out later for service. It’s always a pleasure to see Kevin. Whether he’s working behind the bar, or having a drink of it, he is forever a gentleman and a pleasure to be around. Thanks for adding him to the bartender profiles! Wishing it was time for one myself! Love the “Bartender Profiles.” It’s great to learn the background and perspectives of the folks behind the bar. Kevin is a class act, the Mike Lowell of bartenders. I dine out most nights a week, and always quietly introduce myself to a bartender or server if I don’t know their name. It makes for a much more comfortable experience. Kevin is great, glad to see him up here. My boyfriend and I went to ES for a mid-week birthday dinner at the bar last month. We quickly toasted and said happy birthday only once the entire time we were there. Kevin somehow noticed and gave us complimentary champagne and dessert at the end. Plus he makes just awesome classic cocktails. I’m glad he is my neighborhood bartender.